Ulster Championship favourites Armagh had to dig deep to see off a determined Down in Sunday's tense quarter-final. 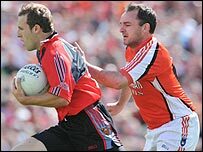 Armagh, going for a seventh title in nine years, were 1-5 to 0-5 up at half-time with Stephen Kernan getting their goal in the 26th minute. With Armagh's Martin O'Rourke sent-off, accurate frees from Aidan Carr got Down to within a point in the second half. But, in front of 31,000 at Clones, Armagh's experience told and they will face Fermanagh in the final on 20 July. Although they failed to reproduce the fired-up performance which toppled holders Tyrone, Down will feel they missed a real chance to reach their first final since 2003. Will Armagh regain the Ulster Championship? Armagh made the better start but spurned two gilt-edged goal opportunities. Charlie Vernon went for the net but his low shot was saved by Down keeper Brendan McVeigh. Then Brendan Donaghy, a last minute call-up for the injured half-back Aaron Kernan, opted to fist over when a three-pointer looked on. Donaghy's effort added to earlier scores from play by Stephen Kernan and Ronan Clarke which had the Orchard County 0-3 to 0-1 ahead, Daniel Hughes getting Down's opener. Further points from Clarke and Steven McDonnell stretched Armagh's advantage with Aidan Carr landing a free in reply for Down. Armagh's dominance was underlined when they scored a fine goal in the 26th minute, a move from deep ending with Stephen Kernan checknig inside Damien Rafferty to shoot past McVeigh. Down suffered a further blow when influential centre half-back Liam Doyle limping off with a knee injury but two more Carr frees saw them claw it back to 1-5 to 0-5 by half-time. O'Rourke was dismissed for a second yellow card offence when he fouled Damien Rafferty and, although Paddy McKeever landed a free for Armagh, a further three from Carr meant Down were just a point behind at 1-6 to 0-8. The momentum seemed to be with Down but the strength of seasoned campaingers like front men McDonnell and Clarke saw Armagh secured a four-point success. Down: McVeigh; Howard, McCartan, Rafferty; Carr, Doyle, Murphy; Gordon, Colgan; Murtagh, Rogers, Hughes; Clarke, Coulter, Sexton. Armagh: Hearty; Mallon, Bellew, Moriarty; Donaghy, A O'Rourke, C McKeever; McGrane, Toner; Vernon, P McKeever, M O'Rourke; McDonnell, Clarke, S Kernan.